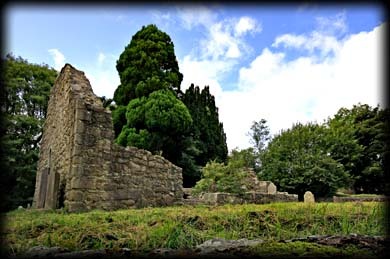 Located in the foothills of the Dublin Mountains is the ruined Church at Kiltiernan, or Cill Tiernan. 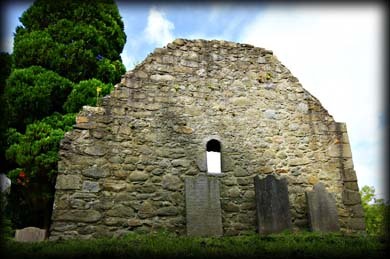 Originally believed to have been built in the 12th century, it is now thought that part of the west gable may be from an even earlier church which consisted of a simple oblong building without a chancel. Externally it is said to measure forty-eight feet by twenty-four feet, with the walls being nearly three feet thick. Little is known about the founder of the church, St Tiernan, whose festival is celebrated on April 8. This ruin and it’s graveyard evoked feelings of reverence for the past and for the stonemasons who built this fine structure. Situated: From Dublin city take the M50 south then take exit 15 and head to Kiltiernan, from here take a right turn at the texaco garage, you will come to a sharp bend with a cul-de sac straight ahead, take the right turn down the cul-de-sac and follow the road till you come to the ruined church. Discovery Map 50: O 2003 2203. Last visit Sept 2009.